What is inbound call center software? Inbound call center software is a software system that manages incoming calls, messages, emails and web content in a contact center. 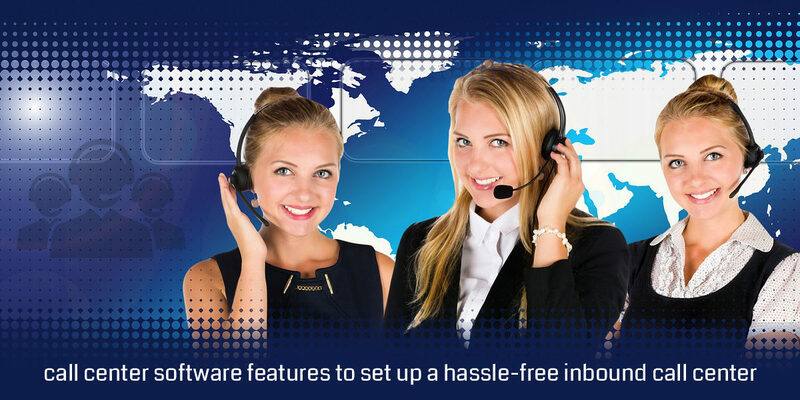 Nowadays the demand for inbound call center software has risen to a great extinct, considering thus, many IT firms has developed the software to help small & medium size call centers. Before choosing the inbound call center software, you must aware of these essential features. Automatic call Distributor or ACD is one of the most important features in a call center software features. This feature helps call centers to distribute their incoming calls to the right department. Multi-level Interactive voice response (IVR) is one of the crucial features to have in an inbound call center. A multi-level IVR system prompts the customer by various voice recordings to choose the right department. Skill-based routing allows call centers to improve the client satisfaction metrics of their organization. These features let inbound call centers to route their callers to the most qualified agent who can solve their issues. Customized call queues feature is one of the best features that inbound call center software must have. It allows agents to select the most important calls from the call queues that are organized on the basis of customer requirements. The customer relationship management system is always important for a business. The built-in CRM feature in an inbound call center software allows call centers to have the detailed information about their callers. The business toll integration feature of inbound call center software makes it easy for call centers to integrate with various business tools or applications. Call centers can use the data of their callers on various platforms to see the performance and traffic of their call center instantly with this feature. A dedicated phone number allows call centers to mark their valuable customers. The dedicated phone numbers feature allows businesses to attend their VIP callers and maintain the level of customer satisfaction constant. Inbound call centers are the busiest workplaces out there. They attend the queries and deals with the frustration of their callers. This inbound call center software feature allows agents to keep track of their callers outside the business hours as well. The real-time metrics feature of an inbound call center feature that shows the real-time analysis of the performance of the call center. Inbound call centers can see the number of calls, agent number, and quality of calls and timing of calls with this feature. Historical reporting feature of Inbound Call Center Software allows you to see the past data of your call center. In case you want to know about particular caller’s issues you don’t need to do much but use this feature to show the information. The open source inbound call center software is developed with various open sources frameworks like Freeswitch, Asterisk, Web RTC and OpenSIPs. These open source frameworks can be modified, distributed and used on various platforms. These open source inbound call center software help call centers to customize their business needs and customers requirements as well. If you want to deploy an inbound call center software in your call center, there are numerous software providers available in India. Sip2Dial is call center software that allows you to access its features freely. You do not need to do much but register for an inbound call center software free trial. This free trial is for thirty days and you can easily check how effective the features are to fulfill your needs with this. Next Next post: How To Send Bulk SMS Through Internet Free Of Cost.